Wow, lovely. Where is this? Congratulations on your Contest Finalist win in Into The Void Photo Contest! 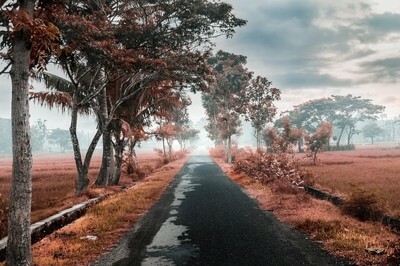 The photo was taken on the countryside road in Bantul, Yogyakarta, Indonesia. I took this picture at morning. At that time, it was already cloudy and there were no one there. I didn't bother with any lighting. All natural. Since the sun light are coming from the side and it's a bit foggy on the far side. Just a little imagination and an empty road with almost all natural. I'm using Lightroom 6 for basic adjustment, like decrease the highlight and increase the shadow. And then I transfer to Photoshop CC. For some reason I just thought the color doesn't fit, so I change all of it from green to red used nik color effect. Then make a little adjustment to make the photo more dramatic. I always carry my Sony A58 with lens Sigma DC 18-200mm f/3.5-6.3 and Sony DT 30mm f/2.8 macro. And my tripod.